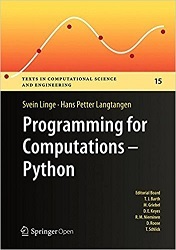 This book is intended for novice programmers, especially students, teachers, engineers and scientists from areas related to mathematics and numerical mathematics. Each treated concept is illustrated and explained in detail by means of working examples. Svein Linge is a professor of modelling and simulation at the University College of Southeast Norway and holds a Dr. Scient. degree in biomechanics from the Norwegian School of Sport Sciences.